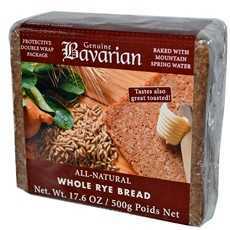 Enjoy Bavarian Organic Whole Rye Bread. Savor The Flavor And Texture Of This Delicious Dark Bread In Your Favorite Sandwich Or Toasted With Jam. (Note: Description is informational only. Please refer to ingredients label on product prior to use and address any health questions to your Health Professional prior to use.